In this remarkable introduction, Stephen D Smith, the new Executive Director of the USC Shoah Foundation Institute for Visual History and Education, describes the inspiring journey he and his family took in creating the first Holocaust centre in Britain. This story was written in response to many questions. 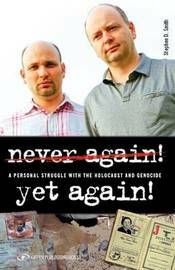 It replies with a powerful challenge to all who think that 'never again' is really worth the struggle. The Australian Centre for Jewish Civilisation hosts this lecture by Stephen Smith, the new director of the Shoah Foundation Institute at the University of Southern California and co-founder of the Aegis Trust. In his powerful address, Smith discusses the past century of crimes against humanity and genocide: the links between them, and the ways to understand them in order to avoid them in the future.